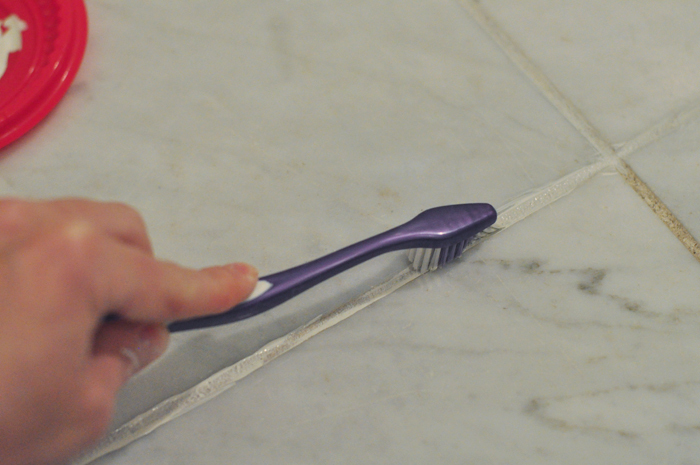 How To Paint Dirty Tile Grout. Elbow Grease Optional. Because my sister and I were spoiled growing up with things like garbage disposals and automatic dishwashers, my dad’s mother was always flabbergasted when we didn’t really understand simple concepts like hand washing the dishes. Unfortunately for us, Grandma’s retro, 1,500 square foot bungalow didn’t have the time for a dishwasher. It was too busy showing off its spotted brown linoleum flooring to concern itself with things like contemporary mechanics. And really, now that I take the time to think about it, I’ve been pampered my entire life with running water and dishwashers and washing machines and time to think. So when faced with an arduous task like scrubbing the disgusting brown tile grout left by our home’s previous owners, I feel an urge to throw myself across a Victorian-era fainting couch, dramatically drape an arm over my eyes, fan myself with a flourish, and beg the butler for a glass of water because elbow grease is a bodily feature I’m sorely lacking. 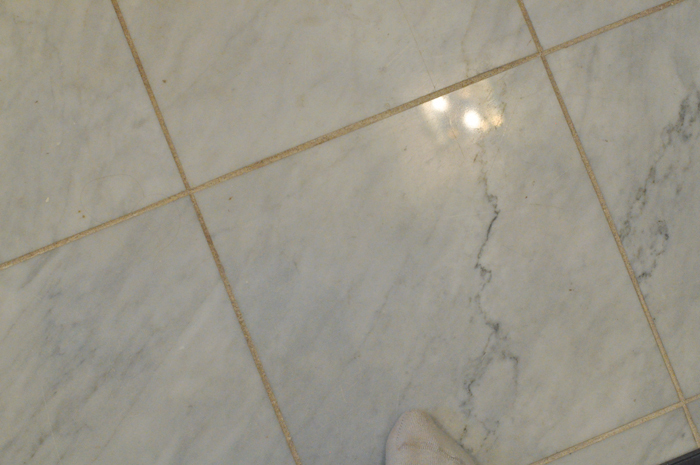 I tried scrubbing the grout. Honestly, I did. 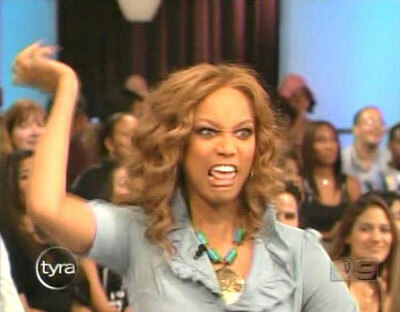 I made myself sick from bleach fumes and squeezed as much grease out of my elbows as I could possibly squeeze. 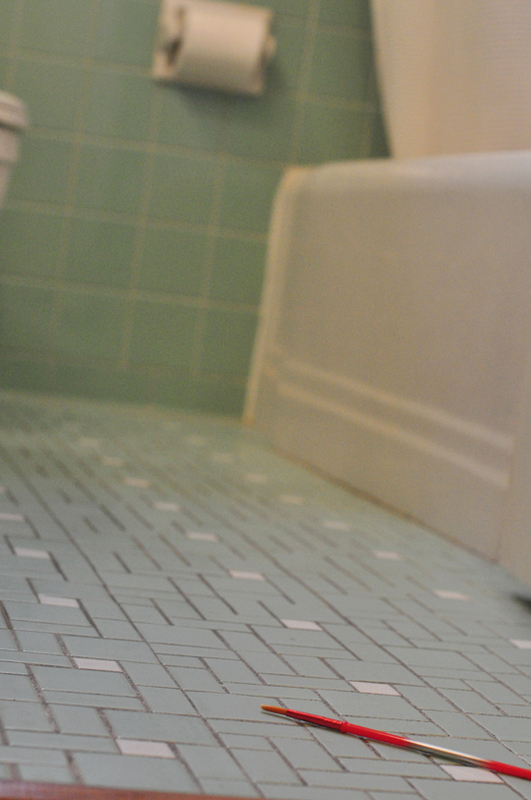 But the grout throughout the house, which I know was once white, was still a grungy black, brown, or yellow. This is why when it comes to cosmetic home improvement projects, I’m a firm believer in the concealer method. See, the cosmetic workings of a home that aren’t structural or part of any major infrastructure (like electric, HVAC, or water) are like the dark under-eye circles of the house. Unlike the serious mechanics of bone or heart health, under-eye circles don’t require exercise, change of diet, or consultations with experts to fix. Though, arguably, a change of diet could potentially fix the core issue — all you really need to make it look right again is a little dab of concealer. Fortunately, they make concealer for grout. Yep. Those are my back-to-school section of Target craft brushes. It was less daunting than making an extra stop into the 7th circle of Hell, otherwise known as Hobby Lobby. I used Polyblend GroutRenew in Snow White. But then I got real and decided that the entryway was a much more realistic place to start. Don’t mind the sawdust and zebra carcass. Other things were happening here that I don’t care to discuss. 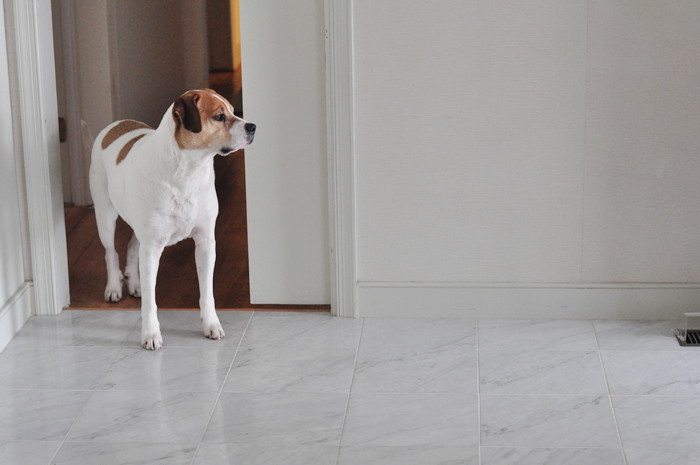 For some reason I can’t fathom, one of the previous owners laid big marble tiles over the gorgeous hardwoods in the entryway. Maybe they thought white grout was easier to clean? But that brown-yellow grout was embarrassing. So, in my totally non-embarrassing style, I stuck a Dumb and Dumber DVD in my laptop, hit “play,” and set up camp in the entryway for a couple of hours. 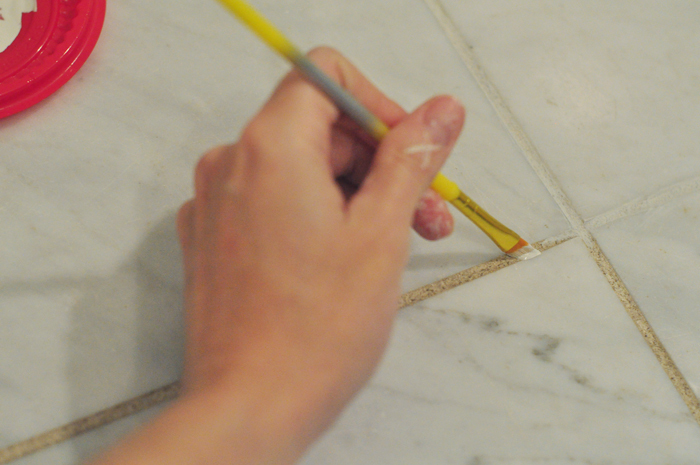 I thought I could get away with Sherry’s method of just using a paint brush to apply the grout renew and paper towel to wipe the edges clean, but that still looked way too gloppy and uneven over the grout. Yeah… all those little dog hairs and stuff? They don’t mix well with grout paint. Working in smallish sections, apply GroutRenew with a size-appropriate craft brush. I liked the little angled brush for better control. 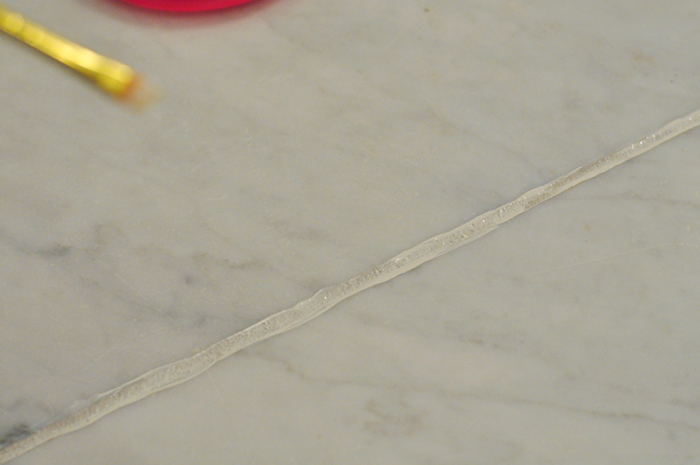 Use a toothbrush to work the paint evenly into the grout. 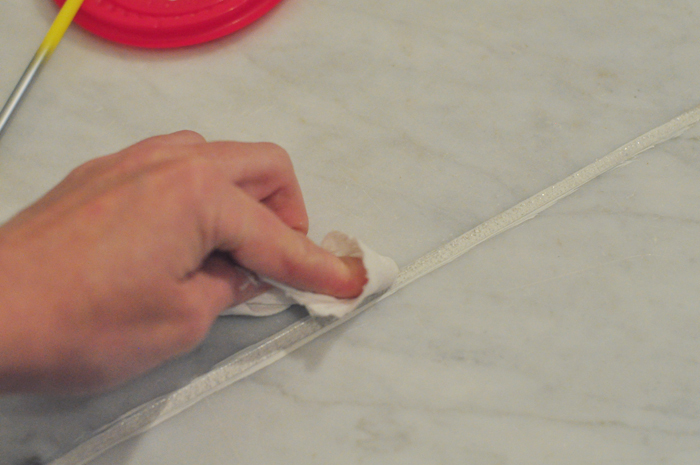 Wipe the tiles clean with a paper towel. Working section-by-section is key, because the GroutRenew dries fairly quickly. Hard on the knees? Absolutely. Now, my astroturf exterior entry is still an embarrassment. The wallpaper mural just inside the doorway is still an embarrassment. But the grout? The grout is no longer an embarrassment. A little goes a long way. After doing the whole entryway, I still have most of the bottle left. 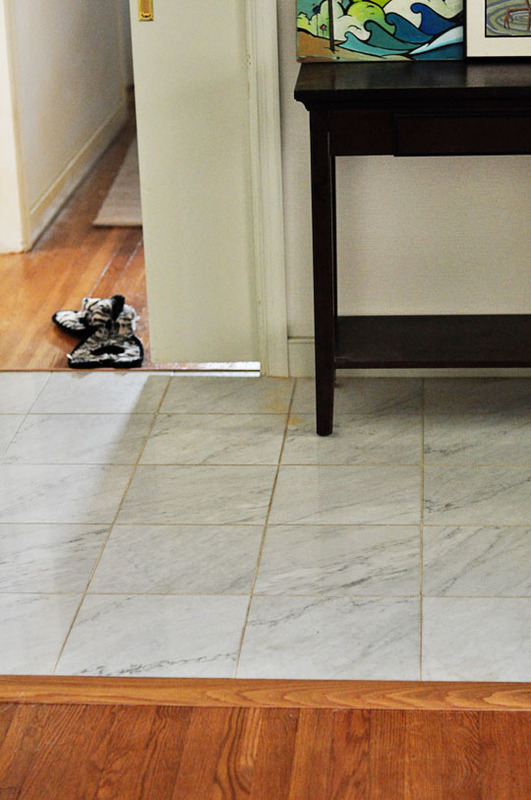 I’m not a fan of tile as a flooring material in general, and grout? Cleaning grout is something only maidens who grow up serving mean ugly step sisters but eventually get to marry rich princes should have to do. Anyone want to paint that bathroom grout for me? I am going to buy this stuff instantly! I’m not sure why I ever, EVER, thought that white grout with my new white tiles in my bathroom was a good idea. Because it wasn’t. Long story…but even the gentleman that installed the tiles questioned me more than once about my decision. Anyways, the only thing I’ve found (on Pinterest) that works to clean grout is a mixture of water, white vinegar, Dawn, and baking soda. It really does make the white, white again. It’s amazing but, hard to work with, because it grows like some kind of science project. 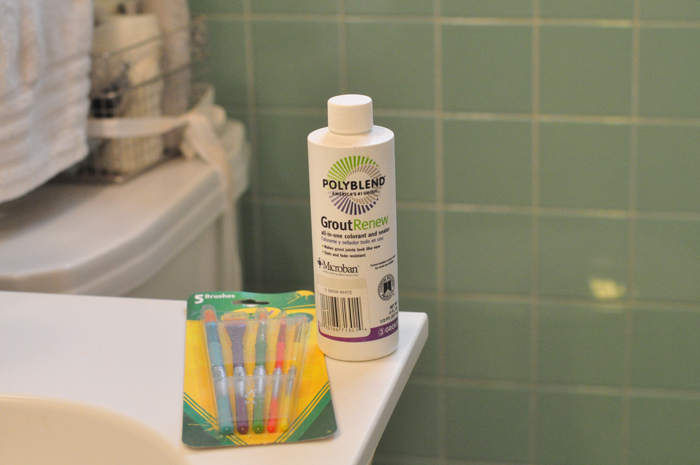 Where did you purchase the Grout Renew? Ha! 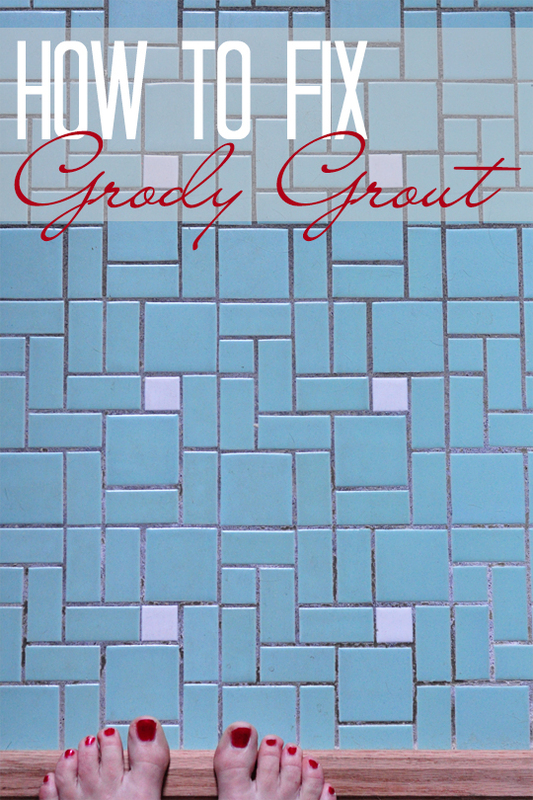 You probably figured that any other color would look dirty next to white tiles, but unfortunately white grout ALWAYS looks dirty! ;) This stuff comes in all kinds of colors so you could go with a gray and it won’t look grungy anymore. I bought it at Home Depot — I think it was in the tile area! it looks so nice now! and at least its just a small section of the home? although I totally get why its immensely frustrating its there at all, what with the nice wood floors it could have been. 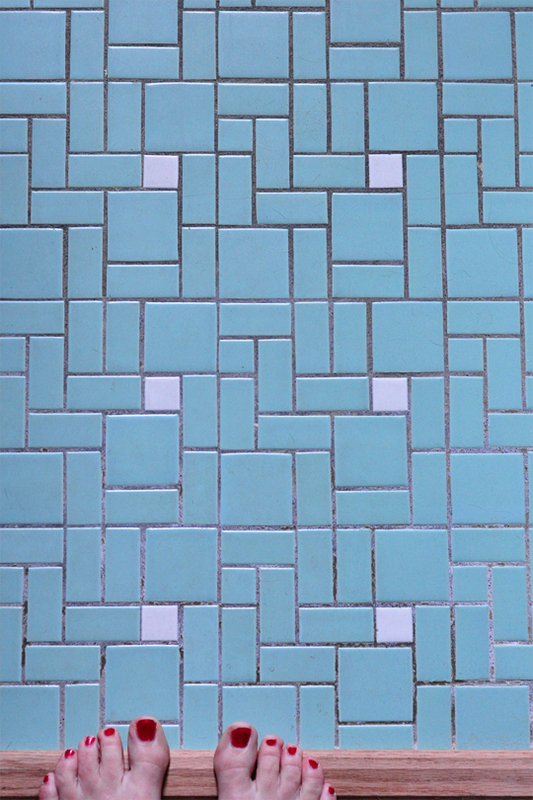 when i lived in florida our whole house was tile with white grout… my poor mother. I never helped her clean it, bad daughter that i am. 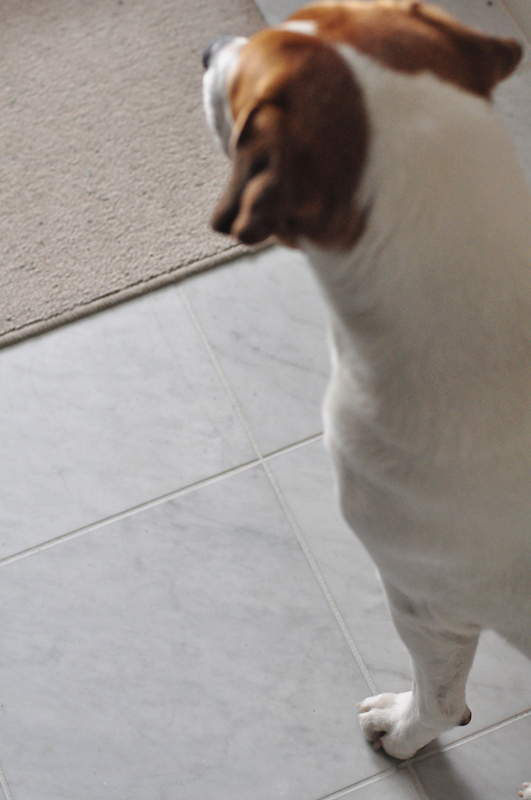 I *suppose* tile floors make sense in Florida because they stay nice and cool, but ugh. I don’t envy your mom that white tile. I actually wish I’d considered painting this grout gray since it will still need to be cleaned, but ah well — it’s still a huge improvement! Using the dishwasher as a drying rack is actually quite brilliant! Since it’s just Justin and me in the house, we mostly wash our dishes by hand as use a drainer in the double sink and a drying mat next to the sink, which makes everything look messy-yet-accessible. We should totally start using the dishwasher for drip-drying! Genius! The 7th circle of hell — now, that is funny! I’m so glad I know about this stuff. I live in a two-story prairie bungalow, BTW — I clicked on that link about your grandma. Wish I had read this before my trip to Home Depot today. Next time! That’s the thing about Home Depot — there will always be a next time. 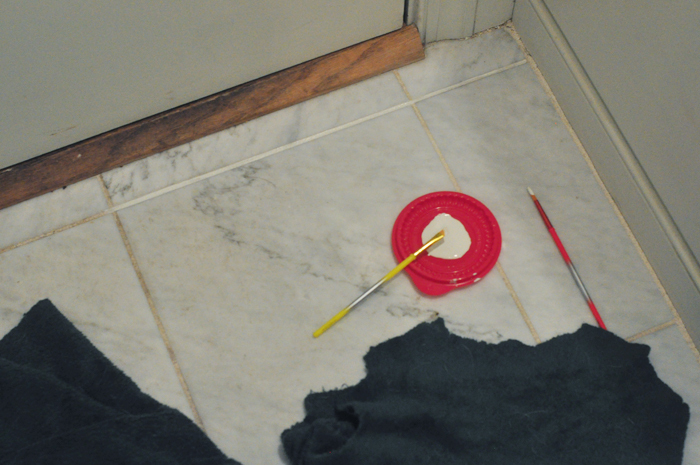 I need you to come look at my shower in my house, I have dark grout and need to ensure that it remains that way, but when I use cleaners it fades the dark color. Hmm, have you tried using cleaners that don’t have bleach? 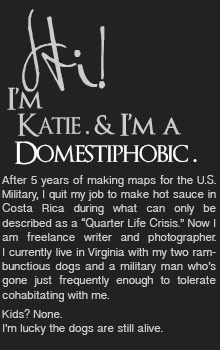 Katie…this is so funny…you know I did the EXACT same thing about 20 years ago with real paint?!?!?! Ha, ha, ha…I did not know this stuff existed…and maybe it didn’t 20 years ago. 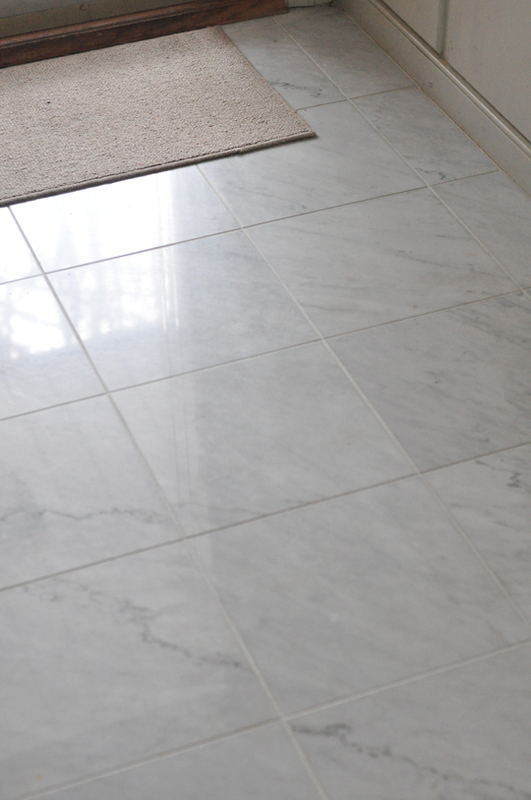 Anyway…..it worked well…even my father was impressed…(He is a marble and tile guy). Great job….looks beautiful…. Ahh I love that you did it with real paint!! I thought about that first, but I don’t like working with oil-based, and I was worried latex just wouldn’t get the coverage and I didn’t want to have to do the work twice. So funny you taught your tile guy father a new trick!